Bruce Jenks with a dairy cow at Maple Valley’s farm in Hadley. There may not be a sweeter college graduation assignment than making ice cream. That was the challenge this spring for 26 seniors in the Department of Food Science at the University of Massachusetts Amherst. 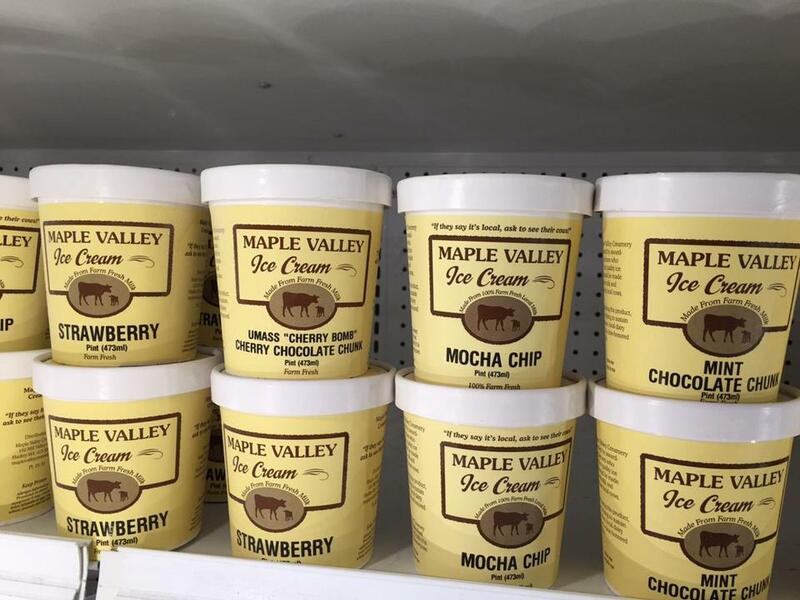 Students who developed the winning flavor saw it produced and sold by neighboring Maple Valley Creamery. Behold the Hadley company’s newest flavor: UMass “Cherry Bomb,” a cherry-based ice cream with pieces of the red fruit and chocolate chunks. The dairy farm and ice cream maker, owned by business partners Laurie Cuevas and Bruce Jenks, is known for using only local cream and milk and all natural ingredients. “This was the first year partnering with Maple Valley Creamery,” says Sam Nugen, the UMass professor who taught the course. Carolyn Dirnfeld, 22, was on the winning team. “In the beginning, we had a lot of crazy ideas,” she says. One was a Kentucky bourbon pie flavor, but “the alcohol was too strong.” A mixed berry concept was too complicated (and costly), so the team opted for just cherries and added chocolate. Similar to Ben & Jerry’s popular Cherry Garcia, Dirnfeld says this ice cream is made differently — without eggs, according to Maple Valley’s criteria — and has a simpler flavor profile. Maple Valley’s Cuevas, 47, and Jenks, 52, both grew up on dairy farms. Today, they graze 38 Brown Swiss cows on land leased from Fort River Farm. Making ice cream came about five years ago. “We were looking for a way to get a better price for our milk,” says Jenks. “We knew we could produce a good [ice cream] mix with local cream,” he says. The duo doesn’t use eggs, which most commercial ice creams contain. “We’re dairy farmers, we own cows,” he says. “We’re not chicken farmers.” Cream, he says, “where the butterfat lives,” is more expensive than milk or eggs, but he and Cuevas prefer the taste and mouthfeel. They use cream from their own cows and buy the rest from Mapleline Farm in Hadley, McCray Farm in South Hadley, and Highlawn Farm in Lee. 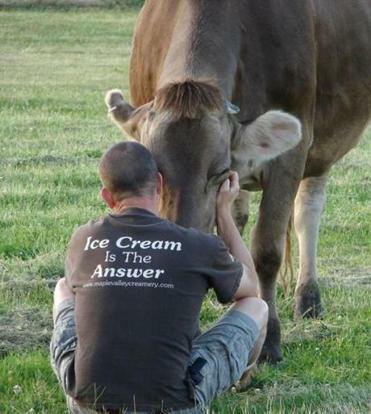 Milk comes from Shaw Farm in Dracut, where most Maple Valley ice cream is made. The 107-year-old Shaw Farm operates both a milk bottling and ice cream facility. “It makes a lot of sense for [Maple Valley] to partner with someone like us,” says Warren Shaw, the dairy farm’s fourth- generation owner. Jenks says they churn out a few thousand pints a week, year round, and sell about the same amount in winter as summer. The most popular flavors are vanilla, maple-walnut, maple-bacon, Himalayan sea-salt caramel, and mint chocolate-chip. Seasonal specialties, such as pumpkin-Oreo, are always a hit. Maple-bacon, made with syrup from North Hadley Sugar Shack, is labor-intensive and includes caramelizing bacon. “We keep trying to make it go away and it won’t,” says Cuevas. The flavor took on a life of its own after the “Today” show’s Al Roker tweeted about it in 2012. The most unusual flavor is Taft Farms Ghost Chile Dark Chocolate, named for the Great Barrington farm that grows the super-hot peppers. “We’re not afraid to try different things,” says Cuevas. Hadley’s Esselon Coffee Roasting Co. provides extract (coffee ice cream); Maplebrook Farm in Bennington, Vt., ricotta (lemon-ricotta ice cream), and Valley Malt in Hadley malt (malted vanilla). The ice cream company is donating 50 percent of Cherry Bomb’s proceeds to the UMass food science program for future product development.